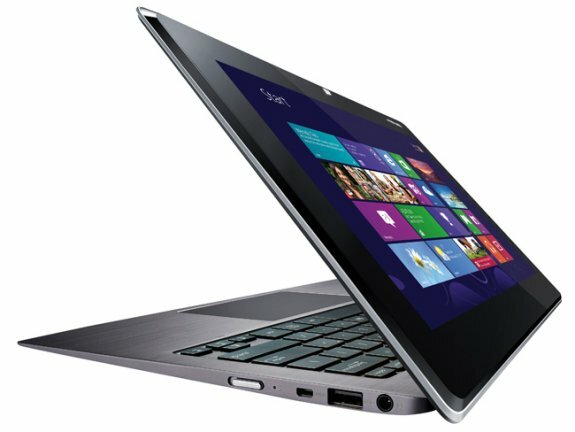 ASUS officially announces Taichi, a new 11.6-inch Windows 8 ultrabook/tablet hybrid with two Full HD displays. Pricing and availability is unknown, but you can find the full specifications at ASUS. ASUS, a global leader in the new digital era, today announces TAICHI, a sleek and stylish Ultrabook™ with an innovative back-to-back dual-screen design for unparalleled mobile flexibility. TAICHI features a powerful Intel® Core™ quad-core processor and two back-to-back Full HD screens for sharing information in exciting new ways, all in a slender profile that tapers to a mere 3mm and weighs just 1.25kg. With a unique dual-display design and stunning black-mirror finish, ASUS TAICHI™ combines the best features of both multi-touch tablet and Ultrabook™— and switches seamlessly between the two simply by lifting a finger. Lid open, TAICHI is a powerful Ultrabook™ with a Full HD screen, backlit keyboard and large multi-touch touchpad for making light work of demanding productivity tasks. Lid closed, TAICHI becomes a lightweight tablet with a Full HD multi-touch screen, for easy and intuitive use on the move. ASUS TAICHI™ features a powerful Intel® Core™ quad-core i7 or dual-core i5 processor with 4GB memory, Intel® HD 4000 graphics and a choice of blazingly fast 128GB or 256GB SSD storage. Dual-band Wi-Fi with Intel® WiDi and Bluetooth 4.0 offer high-performance wireless connectivity, while two USB 3.0 ports provide full support for the latest high-speed external storage devices and rapid mobile device recharging.